Our contemporary lifestyle may have brought additional benefits to Island life, but for one annual summer visitor from Africa it has made a significant impact on their much needed habitat. 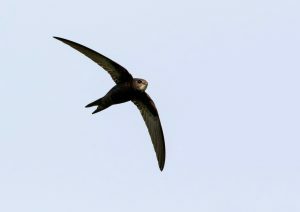 The Manx Ornithological Society, in conjunction with Manx BirdLife, have now joined forces under the banner of Swift Action to assess the breeding population of the swift, and monitor current numbers after a visitor from Tasmania noted a decline in the local population in comparison to a previous visit and suggested setting up a project to help them. Undistinguished by their somewhat plain, brown colouring, they are more likely to be remembered for their dexterity and distinctive sound as they soar upwards and onwards – their long, scythe-like wings and short, forked tail strikingly silhouetted against an endless sky. Spending most of the time airborne, where they happily eat, mate and sleep on the wing, they head to the Isle of Man to breed, typically arriving during the month of May and departing in August. Unfortunately a decline in suitable nesting sites has been identified as being partially responsible for a notable drop in the number of swifts visiting our shores to breed. As a rule they favour elevated holes in wall crevices, eaves of houses, spires and ch urch towers, but many sites have been lost due to our enthusiasm for building renovation. But this is where you can help raise awareness and appreciation of this fabulous bird, in an effort to encourage more nesting opportunities on the Isle of Man. 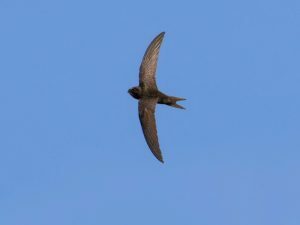 Swifts are communal in nature, and project organisers anticipate that the greatest success can be achieved by encouraging new nesting sites in the vicinity of other established nests; although it is possible to gain their confidence on a new site using recordings of their screeching calls. And here’s what you can do to reinforce the bird’s presence on the Isle of Man. If you suspect there might be a current nesting site you can easily record your sightings on the Manx BirdLife website, or by telephoning Janet Thompson on 835524, noting its approximate location and number of birds sighted in recent years. Alternatively project organisers would welcome anyone (including children and young people) who would be interested in either helping to monitor specific sites, or know of a suitable location for new nesting boxes, to contact them for further information.